Nevada County originally considered replacing the bridge at Edwards Crossing due to safety concerns, but after hearing input from the public, officials have decided to pursue other options. 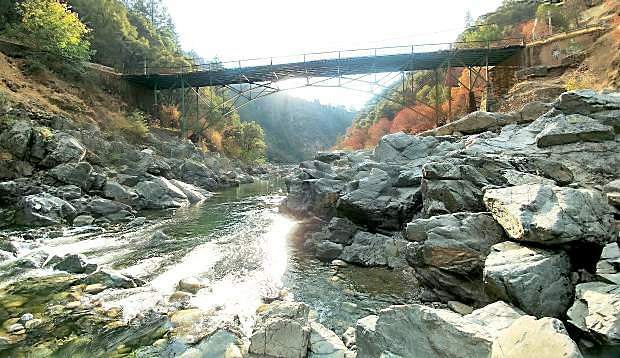 After receiving feedback from the community, Nevada County’s Public Works Department has narrowed its options for a structurally deficient bridge at Edwards Crossing on the South Yuba River. One option is to build a second, permanent bridge for vehicle traffic on North Bloomfield Road and complete a scaled-down rehabilitation project on the existing bridge, restricting its use to only pedestrian and bicycle traffic. The setup would look similar to the Highway 49 crossing on the South Yuba River, where a new bridge was built for vehicles and the old bridge was preserved for pedestrian use, said Joshua Pack, the county’s principal civil engineer. The other option, Pack said, is to completely rehabilitate the existing bridge. The project would involve strengthening the bottom of the bridge and updating the decking, railing and paint job. The Public Works Department would construct and install a temporary bridge upstream for pedestrian and vehicle traffic during the repair project, but it would be removed when rehabilitation work is complete. Both options, Pack said, received positive feedback from the public. The county solicited input from community members at a recent workshop discussing the project and through an online survey. The Public Works Department had originally considered a total replacement of the bridge, but Pack said that option was shot down by community members due to the bridge’s historical nature. The one-lane bridge at Edwards Crossing — originally built in 1904 — is the second-oldest bridge in Nevada County. It was rehabilitated by the county in 1989 and has since been deemed structurally deficient. The county received a federal grant in 2014, which set aside upward of $20 million to pay for restoration or replacement projects at eight different bridges throughout the county. Pack said construction on the Edwards bridge project will likely begin in 2020.